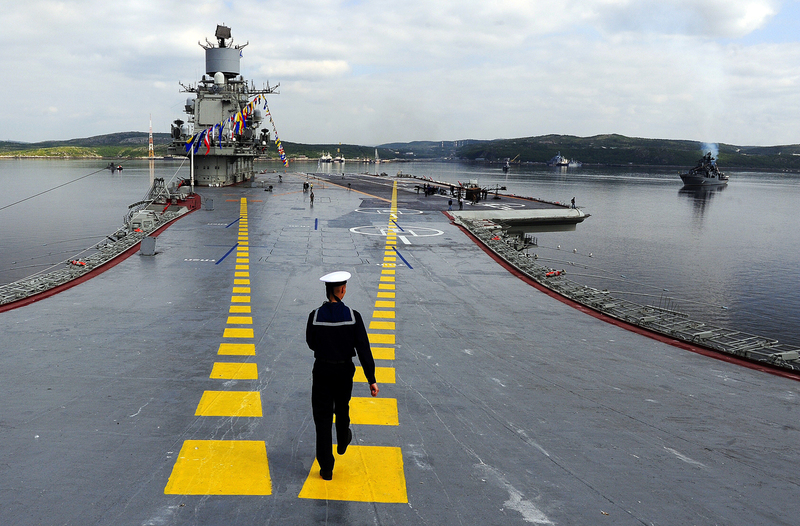 Admiral Kuznetsov heavy aircraft carrier takes part in a parade marking the Russian Navy Day. The aircraft on-board Russia's aircraft carrier Admiral Kuznetsov are likely to test the new X-38 missiles as well as the SVP-24 computer systems for unguided weaponry, in combat in Syria in November this year. Russia’s air force is preparing to try out new weaponry and targeting systems, with full combat tests of the hardware due to be carried out as part of missions in Syria, a source in the Russian military-industrial complex told RIR. The Russian aircraft carrier Admiral Kuznetsov will be sent toward Syrian shores in November 2016, with the deck-based Su-33 and MiG-29K/KUB fighters and Ka-52K Katran helicopters on board. According to the RIR source, the carrier’s naval aircraft may test the new X-38 missiles in combat action at the end of the year. "We have reinforced our aviation group and will bring in completely new means of destruction to the region," said the RIR source. "MiG-29K fighters will use a totally new type of missile, the X-38, to eliminate the terrorists." The RIR source said the Su-33 fighters, in turn, would get the SVP-24, a new high-precision targeting system for unguided missiles. The system allows for increase in accuracy of air strikes several times over and avoids possible civilian casualties. The system adjusts the flight path based on the fighter's position and flight parameters. As a result, the deviation from the target is not more than a couple of metres. The SVP-24 is only one of a few extra units that will be installed as part of the aircraft's avionics. What are the MiG-29K/KUB and Su-33? Andrei Fomin, chief editor of the Vzlyot magazine, said these deck-based MiGs are some of the latest serially produced 4++ generation fighter jets. "Despite its resemblance to the land-based version of the MiG-29, this is a completely different aircraft," said Fomin. "This applies to its stealth technologies, a new system of in-flight refuelling, folding wings and mechanisms by which the aircraft has the ability to perform short take-offs and land at low speeds." Fomin said the Su-33 was built as an aircraft to ensure air superiority, as a full-fledged fighter-interceptor. The MiG-29K/KUB, meanwhile, is a multi-role aircraft, designed to provide air defence for the naval forces, and also to destroy surface and ground targets with guided high-precision weapons, day or night and in all weather conditions. During the Syrian campaign the naval Su-33 fighters, with new targeting systems, will use gravity bombs. The MiG-29K/KUB aircraft will be equipped with guided bombs and missiles, using the Glonass satellite navigation system. The RIR source in the military-industrial complex said the operational tour could involve around 15 naval MiG-29K/KUB and Su-33 fighters, as well as 10 Ka-52K Katran, Ka-27 and Ka-31 combat helicopters. The Ka-52 ‘Katran’ attack helicopters were designed for the two French Mistral-class amphibious assault ships which Moscow had ordered but were never delivered: French President Francois Hollande terminated the contract to supply the warships to Russia under pressure from France’s NATO allies after Russia’s takeover of Crimea and intervention in eastern Ukraine in 2014. Those Mistrals instead went to Egypt and, immediately thereafter, Cairo purchased a batch of 50 Russian ‘Katrans’ from Moscow. The remaining helicopters were assigned to the Admiral Kuznetsov, and will make their "baptism by fire" at the end of the year. Vadim Kozyulin, a professor of the Academy of Military Sciences, noted that the land-based Ka-52 helicopters proved successful in the Syrian campaign. The new machines would also have to demonstrate their combat potential to prospective buyers.